Art and Design in Indonesia has blossomed since the end of the Suharto dictatorship, fuelled by the people’s desire for self expression and in response to a changing urbanised landscape. (Modern Art Edition 2012) Under the rule of Suharto, the arts were very much segregated to the formal and the traditional. In discussion with visual comunications student Intan Purnamasari, it appears the contemporary arts scene is still very much driven from, or responding to, traditional arts and crafts. “There is lots of Batik and Wayang, which are traditional arts, we still want to maintain and keep the culture of Batik and Wayang.” (2015, pers. comm., 29 April) However, while keeping that tradition alive, Intan explains that there are modern interpretations of these artforms. Similarly in painting, a uniquely Indonesian hybrid of modern and traditional exists – for example the works of Gusti Agung Istri, an female artist part of the Seniwati Arts Collective. Her paintings are highly refined and traditional, yet also have modern references in technique and composition. As Indonesia progresses and changes, influenced by globalisation and urbanisation processes, this is reflected in the contemporary arts scene. Intan identified the high density of the population, and subsequent traffic and pollution issues as key problems in her experiences of living in Jakarta. (2015, pers. comm., 29 April) The expansion and over-crowding of cities brings up questions of identity, that tradition and tighter-knit community living perhaps once solidified. 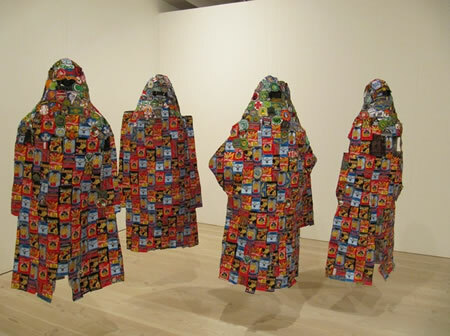 Artists such as Mella Jaarsma question what constructs identity in works such Moral Pointers (Modern Art Edition 2012). Indonesian artists and designers are responding to a changing environment, where the search for new senses of identity firmly shapes their practices.